Tea Tree Skin Clearing Facial Wash will prevent blemishes and remove excess oil with a refreshing gel-based cleanser that won't over-dry your skin and is gentle enough for daily use. 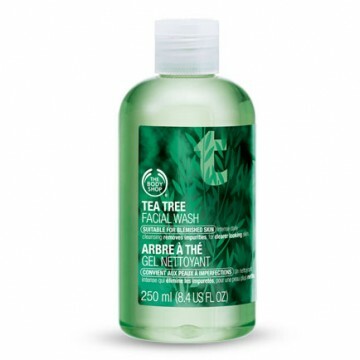 The Body Shop Tea Tree Skin Clearing Facial Wash is formulated with a triple blend of natural active ingredients. Community Fair Trade tea tree oil antibacterial properties protect skin. Lemon tea tree and tamanu oil work together to keep skin clear by helping to prevent blemishes and blackheads, and controlling excess oil.